Humorous, balanced mix of biography, autobiography, and self-help guide appeals to cooking fans and non-cooks alike. 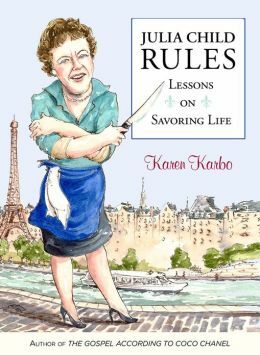 In Julia Child Rules: Lessons on Savoring Life, Karen Karbo explores what made Julia Child so successful. She parses the aspects of Julia’s personality, her struggles, and her joy for life that made her the influential icon we all know today. It is also part autobiography of the defining moments in Karbo’s own life, such as the death of her mother when Karbo was seventeen. The author intersperses the perfect mix of personal anecdotal information, and her fun personality comes through in conversational writing. There are many footnotes, too, where Karbo’s humor is most evident. But, ultimately, it is a self-help book about how to find true happiness, following Julia Child’s guide to life. For a book about Julia Child, Karbo’s perspective is somewhat unexpected, because while Karbo clearly admires Julia Child as a person, she does not seem to share Julia’s love of cooking. She’s enamored mostly with Julia’s willingness to immerse herself fully in a new craft and career so late in life (in her late thirties), and that motivation is what Karbo encourages readers to emulate. She isn’t encouraging readers to love cooking, but to find their own passion—the thing they would want to devote themselves to fully, as Julia did when she set out to write a comprehensive cookbook on mastering the art of French cooking. For that reason, this book will have wide appeal. Those who love cooking and those who don’t, those who are fans of Julia Child and those who aren’t, will all find Karbo’s suggestions useful and thought-provoking—because the “rules” aren’t really about cooking at all. They are about overcoming adversity, having a strong work ethic, and not conforming to the expectations of others. Karbo draws these lessons from the fact that Julia (McWilliams) Child married for the first time later in life, after meeting Paul Child while she was working for the OSS (the precursor to the CIA). She also trained as a chef at Le Cordon Bleu in middle age. Karbo even draws lessons from young Julia, who was quite tall as a child—usually the tallest girl in her class or any room she was in, in fact. But rather than view this as something that made her an outcast, Julia found a way to use it to her advantage, never dwelling on things she didn’t have the ability to change. This intriguing book is about how Julia Child became an icon, and Karbo attributes Child’s success to her unique view on life. Here, through a fun and engaging set of rules, Karbo instructs readers on how they can follow Julia’s example and find true joy in life, too.